Azalia Snail has been making her uniquely sweet, hypnotic, noise-inflected brand of pop music since the days before Nirvana broke. Her entire catalog has a spirit of timelessness where you could believe the music was rare gems from the late 1960s as well as from the 1990s when she first appeared on the scene or today. Upbeat, triumphant, & joyous – this is the true sound of resistance & it's irresistable. There’s no handy one- or two-word modifier to assign to the music of Azalia Snail. A singer, songwriter, and sculptor of sound and notes, she came out of New York in the early 1990s and cut a distinctive figure even by Gotham’s standard of independent-minded visionary rock. Over the last 25 years, Snail has worked with seemingly contradictory elements. Her music is low-fidelity to the core and, at the same time, deeply ambient. She has perfected a kind of lo-fi total immersion, where each instrument has the tone of something borrowed or found, but in combination the arrangements give a ragged orchestral beauty to her surreal, catchy compositions. 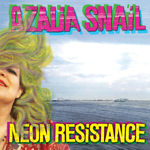 Neon Resistance is the new album from indie pop chanteuse Azalia Snail, on our favorite North Carolina label Silber Records. The twelve tracks have crisp beats, noisy flourishes and intoxicating headiness. Lyrically smart, with sleek arrangements and experimental touches, this is not your usual banal pop music, but rather is restless, enticing and imaginative. Everything we expect from Silber releases. This is an album that takes retro influences and serves them up in a thoroughly modern package. This is a must have. She has always written very personal songs and on her new album, Neon Resistance, that is still very much the case. Its lead track, ‘Celeste (Can You Feel It)’ (video below), is huge, an epic Pop song that will ear-worm its way into your life. Let’s hope there really is that parallel universe where Azalia is a star and appreciated for producing songs like this and then lets all go live there! So many of these latest songs really do stay with you, Azalia has managed to capture her personality in them, produced something unique and original to her and they are just plain catchy. ‘Cherry Blossom’ is said to be a ‘calming song about death’ and it really is like a soothing anthem for everyone. The album was produced by Azalia’s husband, Dan West, who plays with her in LoveyDove. He has done an amazing job and given a track like, ‘Made Out Of Honey’, the perfect measure of everything to make it soar and add to the tally of outstanding songs here that will stand the test of time. Another of the highlights is a cover of Tom Petty’s ‘The Wild One, Forever’. This is a song close to Azalia’s heart and she has been singing it since she was a teen. Her version is quite breathtaking and a wonderful tribute. ‘Every Day is your Day” is said to be the anti-birthday song Azalia has always wanted to write. Why can’t every day be your day, she asks. Whimsical and quirky and very and accessible too, another song destined to last much more than a day. There is a more serious side to Azalia’s music as well, which she delivers with just as much passion, ‘Save this Place’ and ‘Weekend Back’ are described as ‘politically charged mantras that speak about the necessity of revolution and resistance.’ We live in a time when these issues need to be addressed as well. ‘The Moral Chemist’ is brilliant with lovely Latin rhythms and there is even a tribute to Alan Vega of Suicide. The closer is perfect too, ‘I am the Night Sky’, is said to be a song of protection and reflection and it sends us off to our own dreams and realities much the better for spending even this short time in the company of Azalia Snail. The theme of the album is stated as, ‘staying true to yourself, your vision, and the ones to whom you surround yourself. The resistance, after all, is irresistible.’ I couldn’t have summed the sentiments of all these songs better than that. If you love great uplifting and honest songs, then you will fall in love with this album.